NOTE: last two lines added by C Mills to make poem 99 words. When I look at a comet, having been lucky enough to see one, I see a giant snowman, throwing a ball of ice across our night sky, with its tail of dust. We look upon it with wonder. Could this giant hand be playing Rounder’s, or maybe Alleygobs with giant marbles? Is there someone on the other side of our dark sky ready to catch them, to hold onto them for too long before we see them again? Could it be an invisible jockey riding a sky horse or maybe a knight from some forgotten age, looking for Merlin? Being the children of the Gods, they still behaved with human attributes. Or was it just that humans had to have excuses for their own failures? If he wanted them back, he was going to have to look carefully. She took them into the night and with all her might tossed them into the universe. The marbles were pulled by gravity, while gaining speed and left a lingering light trail. The comet streaked across the sky dragging a fiery tail against the inky blackness. Dennitsa shivered in the gathering gloom. Her dreams of late had been infiltrated by the ancestors revealing the prophecy this celestial nomad heralded. Time was running out. The old ways of healing-magic were in danger. Today, the Byzantine priests had instituted a plan to hunt down and kill the fairy witches, thus performing a cleansing upon the land. Ripples of magic exploded from the woman’s form silhouetted against the night sky. The solution came from above. According to the J.R.R. Tolkien’s cosmology of elves, the Eldar who lived with Valar in Aman “were also called Calaquendi (Elves of the Light).” The Eldar developed their faith in magic and became magical elements in the tail of a powerful comet. As long as the Eldar drove the comet, the comet would not die. Because they left Aman, these elves did not live in the world of Arda and were subsequently unknown to the inhabitants of Middle Earth. These comet-dwelling Eldar sailed through the universe, developing new weapons and magic until they attracted the attention of an enemy. The King’s Astronomer Ilesol tracked the arc of the great Comet Cygnet across the starry skies. At midnight, he was alone in the Royal Observatory on the high plateau overlooking Port Estrella. Comet Cygnet was known since ancient times to return to the Terran skies every seventy years. This would be the first and only time Ilesol would see the Comet. In that thought and moment, the Comet seemed to beckon him, to venture beyond Port Estrella, the Isle of Ilbaiyat, to travel the Great Terran Oceans, to explore unknown worlds. A brilliant light filled the observatory. Ilesol vanished! Ethan had taken his little sister for camping. He looked at his little sister pointing up at the astronomical expanse. He could see what she was referring to. Ethan adored his little sister. However, the way she asked so many questions about everything annoyed him to no end. He decided to have some fun. From the small window of the rocket, it looked like an enormous snowball. Comprised of frozen gases, rock and dust, it was the size of a small town. The astronauts realized with horror that there was no escaping it. The rocket lay directly in its path. As the frozen ball’s orbit brought it closer to the sun, it obliterated the rocket, ending its urgent mission immediately. The comet heated up, releasing dust and gas which formed a glowing head and long trailing tail. The people of Earth rejoiced in its beauty, not realising the loss they had just suffered. They all turned to their silent friend. Shrugging, they watched the comet pass, carrying their wishes. It would return in ten years’ time, granting them what they had asked. Carly would be a dancer. Edward would be building robots. And Chelsea? She didn’t know. How could the comet possibly turn her into a cosmic fairy able to soar through the night sky as it did? I was twenty-four the last time it came, that periodic star that causes ships to ground. She was twenty-six. We drove to the desert’s edge and climbed Blue Mesa in the dark; leaving behind the city lights, the traffic sounds, and the sounds of club music that floated incessantly through the downtown streets. In the stillness we spread our blanket and made love waiting for and watching Edmund Halley’s dirty snowball with it’s retrograde orbit and curved tail. She speculated that lovers had done the same for thousands of years before and will continue to until the comet dies. “Are you afraid I might be right?” Mira asked, cocking her head to the side like a puzzled parrot. “I told you so, Frank,” she said, waving up at the light. It started as a tone, growing in volume and pitch as it resolved itself into a bright streak, slicing silver blue through an opaque night sky. The tone grew to harmonies as dark stars broke free and distributed themselves across the horizon. The first one rolled its eyes as the other two giggled. The dark star slowed, resolving to a single, sweet contralto. It landed in the clearing with a fragrant whump of meadow grasses, rolling, unfolding, and standing tall. I don’t know why the Comet chose privacy, when it struck me. The media remained oblivious of change. I am transformed. I am blessed with supernatural powers. I can see and hear things other mortals cannot. They do not believe that I am going to outlive them. The idiots have locked me up in a cell in the mental asylum. I do not seek revenge. I seek enlightenment for all. I pray for another comet to strike them, so that they see and believe what I say. We are all made of stardust. But, I am the chosen one. I stared and stared, praying for God to reward me. To grant me a glimpse of that celestial spaceship carried in the comet’s tail. But Marshall’s vision was sharper than mine. And his faith. When the time came, we swallowed the elixir, pocketed the interplanetary toll. We lay on our bunks, veiled in purple cloths. We waited. The pain was my soul struggling to escape the bonds of my body. The moans were angels serenading us to the sky. Paralysis signalled I was becoming transhuman. And yet. What if Hale-Bopp were simply a comet? What if Marshall were wrong? They’re right, I AM an idiot. Moreover, I had to demonstrate my stupidity to the entire world, with my doomsday predictions of comets, and meteors, and asteroids. I’d even set a date for the collision, yesterdays. But they laughed at me, while I hid with my family in the bunker that I’d constructed for us. I should go out and admit to my failure now. Maybe I can just blame it on my tiny brain. Their brains are much larger. That’s why the dinosaurs have ruled over us for ages, and we cockroaches will soon die out, I’m sure. I lay in bed, drifting to sleep in a window filled with falling stars. A cool breeze wafted across my nose, and stardust drifted in my eyes. A cat shadow crept along the window sill. She sniffed the screen and sneezed stars. “Gedsunheit,” I whispered. Her eyes glowed disdainfully down at me, starlight reflected in them. Meteors competed with the moon as they exploded overhead, casting noon-bright shadows on the side of the barn outside my window. Horses stood in the paddock in silent awe, watching the spectacle with equine aplomb. This poses a challenge. I’m never quick to put on my thinking cap. She knows this. Oh, I’m good for a slick rib poke but actual knowledge…that’s a puzzler. “Good luck with that,” she laughs. Pamela, the brunette at the age of 23, was huffing and puffing about her new husband to her friends. “Then, what do you?” inquired one of them. “I raise my voice. I argue. I fight until he bows thee!” she said with a wink and triumphant smile. Pamela meets her old friends who inquire about her life. She blushed at first then pushed the stray grey hair behind her ear, ” I was like a comet, bright at the head, but years changed my perception allowing me to tail away from the headstrong attitude. Rosie was excited about an evening of charades with her women friends. She glanced at her word and said, “This will be tough.” But having once yearned for a career in the theater she knew she was up to the task. She pointed to the sky and mimicked staring through a telescope. Rosie shook her head no. Then she stretched her arms in a dramatic upward sweeping motion and assumed an awestruck expression. With no answer forthcoming, she kneeled on her hands and knees. Pretending to sprinkle something onto the floor, she started scrubbing. Janet scrubbed with all her might, but the brown ring remained. As she did every day, leaning over the toilet bowl, she found herself hating her job. The same stains, the same sore arms, and the same cleaning solutions. She had studied astronomy in school, but apparently there was no more need for people who looked up at the stars. Now she only found herself looking down. She dumped more Comet into the toilet and scrubbed with irritated vigor. 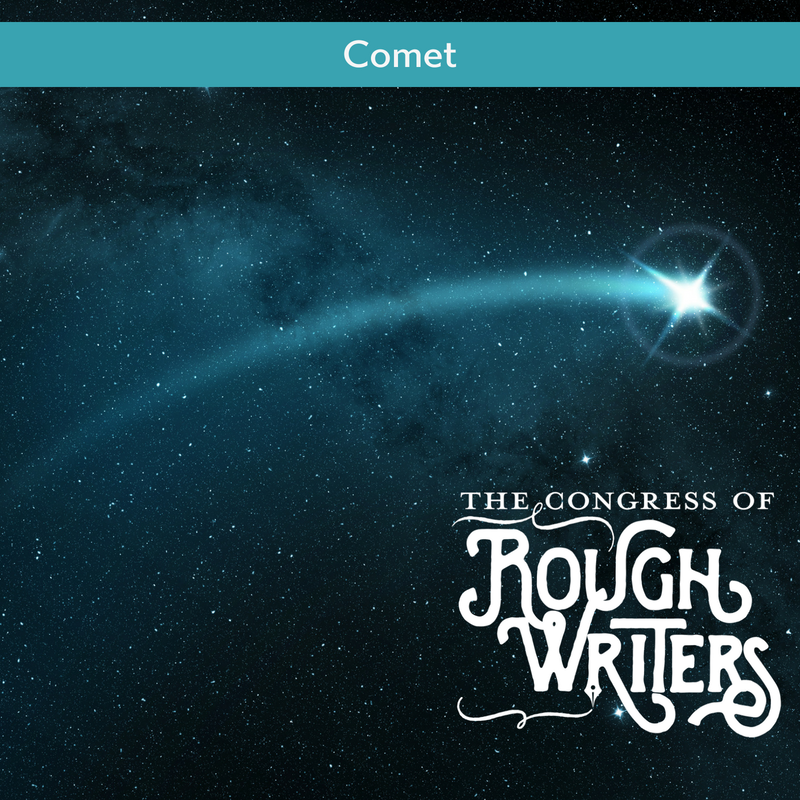 Comet, The irony of the name stung. There was one shooting start that would never make her dreams come true. Rahul was alone on the terrace in this moonless night. A comet appeared on the night sky with its long tail following luminous body. Internally, Rahul accepted his failed career compounded his drinking and philandering habits, culminating in divorce from Heena. He simply did not want to hear about his weakness from Heena. He did not want to extend comet’s tail any farther by strangling her. Stanley spoke to Bert on the carpool drive to work. 4:30am rise time. Hit the road by 5:15am in order to make it to the factory on time. “Yup. Sure don’t.” said Bert. Suddenly, in the sky in front of them, a huge ball of fire, complete with a sonic boom. “Jiminy Cricket!” shouted Stanley, Startling Bert. Across the sky, the ball of flame got closer. Suddenly, there was a flash and the comet (meteor) burned out. Two friends, friends since high school, different in backgrounds but united by their uniqueness. Friends through husbands, children, divorces. They sat together on a park bench by the river walkway, watched couples stroll by hand in hand, a canoe slide down the river. Heard a whippoorwill call. Felt a gentle breeze. Contemplated the white slash of the comet against the ink-black sky. A glance exchanged. A wry smile shared. They clasped hands. Embraced. Kissed. In the early sixties, it became common for smaller schools to consolidate into larger schools. My county was no different with several schools opting to consolidate. Not my school, however; our district chose otherwise! Elgin became one of those county schools; it was supposedly named by combining the three schools that made up the new school: LaRue, Green Camp, and New Bloomington. Elgin even named their mascot based upon America’s new obsession of space. Elgin was our biggest football rival, and often, the conference championship hinged on the last game, us against them, with the Comets streaking to victory. He scrambled through bushes, slipping and sliding on twigs and gravel in haste to his love. When he reached her, she was doubled over holding her belly. “I thought…” Her body shook. “What?” he soothed, wiping away tears. “Snake… I thought…” She pointed. On the bed lay the strap of his telescope bag coiled neatly. Camping became their family tradition, but their children’s favourite story was of the “snake” that frightened Mum, not of the comet that graced the sky the night that he proposed. Crouched by the fence she watched, reminiscing, smiling at her childhood partner in crime. They had been a formidable team. Each day they had forged rivers, hid in canyons and chased foe. Together, their teamwork had conquered imaginary obstacles. No chore was too tough for them. Sometimes reckless, but always sure-footed, and with mane and tail flying in the wind. She laughed, remembering their nickname, Speed Demon. Those days were gone now. Slowly he came toward her, head high, ears at attention, looking for a treat. Standing, she called her trusted friend, the one she had named Comet. Emily was sitting up and looking out of the window, fascinated by the bright star in the night sky. She turned to her Dad who had just finished reading her a bedtime story. Nancy had been taken so cruelly from them. Emily waved at the comet and snuggled under the sheets, then looked across at the empty bed where her twin used to sleep. ‘Night, sis.’ she said softly. The sunset fades into dusk. Bright pinks and reds slowly change to burnt shades of orange and purple. The horizon glow dims as the blanket of night covers all. The rising hum of crickets and frogs fill the summer night and a warm breeze welcomes us to settle in like the flashing of lights before a performance begins. Time to take your seat. The show is about to begin. With excitement the event begins as the first comet streaks the sky. Tonight is a night of a thousand wishes and with all of mine I wish you were here. “I think she’s scared,” the little girl answers, eyes wide. “The ‘Comet’ is coming!” hollered little Billy Ollerenshaw, at the top of his voice. “The ‘Comet!’ Billy passed by nos. 17 and 19 Combination Street heading towards the town centre. Mrs. Ekkerslike was a placid lady, the far side of sixty, and resigned to her fate. “Best to let him think of a steam train.” said Mrs. Wensleydale, sighing. It was 1910. She was ten. She’d often sit on her windowsill, legs dangling, staring out at the stars. That night, she’d seen something different, a ball of light travelling through the sky. She never expected to see that in her lifetime again, and yet here she was, in 1986, eyes trained on the stars, with her ten-year-old granddaughter for company. A ball of light flashed through the sky. Doris smiled and sat back. “I saw it! Did you see it? Gramma!! Did you see it?” Rosie turned to her grandma. Gramma sat, eyes closed, at peace. By Charli Mills in Flash Fiction Collections on August 23, 2018 . I wished upon each one! Dang, I forgot to write a comet story and I forgot to put the yarns into the form. Oh well. Great flashes here! It felt drafty without yer drafts! Evry week, I get to savor what we all serve up! Yes, it is a fabulous group of writers! A brilliant light filled the observatory. Ilesol vanished! no worries! thanks. You’re doing a great job. I read my story again because it’s interesting to see how the stories flow together. Isn’t it? It’s become a secondary art form to arrange stories, looking for similarities or contrasts. Sometimes one story carries out an idea developed in the first. The collection is a global breath exhaled in a single moment.